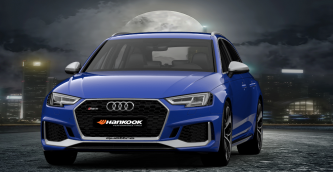 In addition to the Audi TT RS and the RS 5 Coupé, premium tyre maker Hankook is now also providing original fitment tyres for the new Audi RS 4 Avant. Following the tradition of the first RS model, this has a powerful V6 bi-turbo engine, which now has 600 Nm torque and weighs 80 kg less than its predecessor and is bound to live up to the expectations of spoilt sports car drivers. Permanent all-wheel drive in combination with 19 or 20 inch tyres on all wheels guarantees the necessary traction and power required for accelerating from 0 to 100 km/h in 4.1 seconds. The first vehicles were delivered at the beginning of the year and are hitting the road fitted with 265/35 R 19 98Y XL (standard) or 275/30 R 20 97Y XL (optional) tyres on all wheels, including Hankook Ventus S1 evo² with noise-absorbing “sound absorber®” technology. Audi Sport GmbH has not only been inspired by motorsport in terms of looks. Every RS model is required to be unrestricted for everyday use as well as for the race track. This applies to the tyres fitted too, which, in addition to the approval tests customary in the branch, also have to complete ten laps of the iconic “Nordschleife” of the Nürburgring at top speed. Hankook original fitment tyres for the Audi RS 4 Avant provide very sporty handling to match the vehicle. Furthermore, Hankook engineers at the company’s German development centre have made sure that comfort and durability have not been neglected despite the focus on high grip and precise handling. Only tyres that master both everyday and sport applications are approved as original fitment tyres by Audi Sport. During the approval process, Hankook’s flagship tyre was able to demonstrate not only its sportiness, but its durability, comfort and safety too. Short braking distances and an above-average performance in the wet were achieved through the advanced styrene-polymer-silica mixture used for the tread. In addition, the multiple tread radius technology and lightweight rayon carcass always guarantee optimum tread contact for best possible contact with the road during operation. Moreover, the innovative DTM inspired 3-layer block design with its special staircase arrangement of the outer rib blocks thus ensures consistently high grip even as tyre wear progresses, thereby guaranteeing very good traction and braking performance throughout the entire lifetime of the tyre. Interior noise comfort in particular is further enhanced by Hankook’s own “sound absorber®” technology. This Hankook technology is already being used in the original fitment tyres for the Audi SQ7 and RS 5 Coupé models. The reduction of the loud cavity noise typical of sporty, low aspect ratio tyres at higher speeds was a pivotal aspect and a focal point of the development work to provide a top performing yet pleasant driving experience. The Hankook engineers adapted the company’s own silent tyre technology “sound absorber®” used on powerful, large SUVs to date to their passenger car flagship model, the Ventus S1 evo².